Summer Raines knows when it's going to rain. She can feel it. That's why the local weather girl's so good at her job. Too bad she couldn't have foreseen the tumultuous arrival of Travis Lockwood, everybody's favorite star NFL quarterback. Make that former star NFL quarterback. Sidelined back to Texas after an injury, the golden boy is trying to steal her precious on-air time. Summer is reduced to reporting from…football games. It's enough to make her quit and become a storm-chaser like her parents. She's stuck with a career that's going nowhere and a man who delights in her refusal to be charmed. Falling in love isn't nearly as easy as predicting the weather. 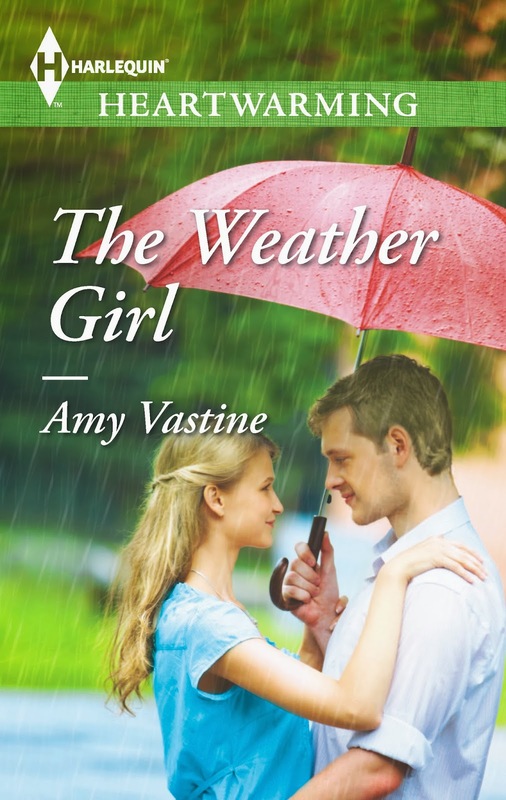 Source: Info in the About The Weather Girl was from the press kit from the publicity team. Her annoyance at that nickname was obvious. Her naturally pink cheeks flushed red and made him smile. She hated him and he loved it. “Mr. Lockwood, good to see you were able to dry off after last night,” she quipped. “I don’t control the weather, I just predict it.” She turned her attention back to her monitor. Her soft-looking curls fell down like a curtain, shielding her face from him. He wanted to reach out and push them behind her ear so he could see those cheeks, those eyes. Her eyes really were amazing. They were big and blue like the Texas sky. “I was the special guest at the Abilene Rotary Club’s luncheon today. They think you have magic powers. Said you’ve never been wrong about when it’s going to rain.” He left out the part where they wondered if she was a witch. “No magic powers,” she said, trying to look disinterested. “That’s what I said. I told them it was nothing but luck, and odds were you’d get it wrong one of these days.” Summer stopped what she was doing and turned her whole body in his direction. “Maybe you could teach me about predicting the rain, then?” Travis knew all about defensive strategy. She could block his pass all afternoon, but he wasn’t going to stop trying for that touchdown. In September of 2012, she saw a tweet about Harlequin's So You Think You Can Write contest. She entered, hoping for nothing more than a little feedback from some people in the business. Amazingly, The Weather Girl made it into the semi-finals, thanks to the many wonderful voters out there! The manuscript didn't make it to the finals, but the editors over Harlequin were still interested. A few revisions later and The Weather Girl was contacted for publication with Harlequin Heartwarming - a dream come true! My perfect weather day: temperature 15-20 celcius degrees. The sun is shining, light breeze and no work!